The COP20 in Lima aimed to approve a draft text of the new international climate change agreement to be adopted at COP21 next year in Paris. Despite a serene atmosphere, it proved difficult for parties to reach an agreement, stumbling over the inclusion of Adaptation to climate change in the text, and being careful not jeopardize development processes by enabling differentiated commitments in relation to countries’ capacities. The Lima Call for Climate Action was finally adopted after extra hours of discussions that ran into the weekend. However, these weeks once again proved the strong engagement and political will of local and sub-national governments to act against climate change, following the Climate Summit in New York, where cities as well as regions and States engaged in global Compacts to enhance their actions. Ronan Dantec, Councilor of Nantes and UCLG climate spokesperson, addressed the Conference on behalf of the local governments and municipal authorities constituency in the opening plenary session, reminding States of their responsibility to reach an agreement by 2015 which would ensure the capacity for all stakeholders to act at their level, and to link the climate agreement with the Post-2015 Agenda. The cities and sub-national governments’ day saw the Mayor of Bogotá, the Vice-Mayor of Paris, the Vice-Mayor of Belo-Horizonte, the Councilor of Nantes, and many other local elected officials and representatives, gathered in Lima City Hall at the invitation of the Mayor of Lima, Ms. Susana Villaran, with the support of the Local Governments Climate Roadmap, to present the actions they are currently undertaking and their ambitions for the future. The need for States to ensure their ability to act through legislation, capacity building and access to financing mechanisms was also stressed in this forum. 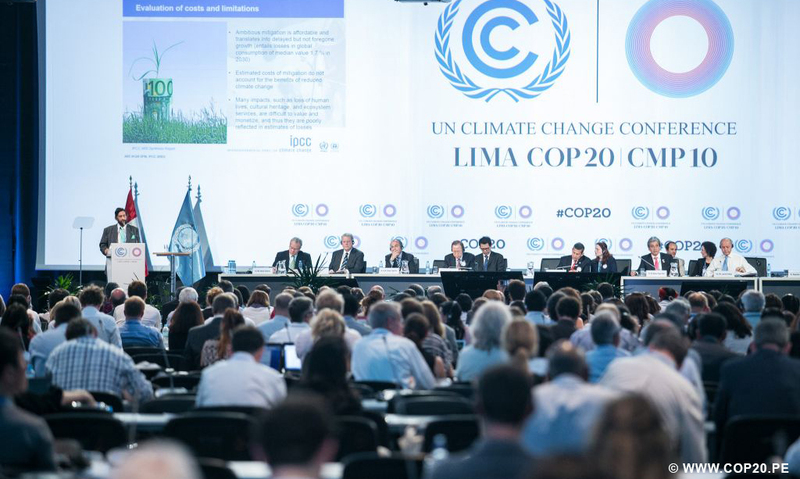 The key outcome of the aforementioned meeting – the “Lima Communiqué” – outlines the key position of the Local Government and Municipal Authorities (LGMA) major group at the UNFCCC. It calls for an inclusive and ambitious post-2015 climate regime, the scaling up of local and subnational actions and initiatives, as well as the formulation of national programmes and plans of action. It also outlines the scientific bases for climate action, and cements the commitment of local governments to step up collaborative climate action and scale down greenhouse gas (GHG) emissions. The Communiqué also fed the ongoing UNFCCC negotiations. The local and sub-national government delegation was also greatly involved in the negotiations, participating in thematic side events and contributing to the ongoing process. Three representatives were invited to present their views and concrete proposals at the High-level event on Lima Climate Action Agenda, an initiative of the COP20 Presidency, Peru, which was chaired by the next COP Presidency, France. The session aimed to engage a multi-stakeholder dialogue and show the need for States to take on board all actors’ contributions to be able to reach their commitments, and provided examples of the actions that civil society, businesses and local and sub-national authorities are already undertaking worldwide. An official platform, the Non-State Actor Zone for Climate Action (NAZCA), facilitated by the UNFCCC, was also launched. At the High-level Segment, which saw the participation of Heads of States and Governments and Ministers, the Mayor of Lima praised this initiative and urged leaders to ensure that the Lima outcomes enhanced the engagement and empowerment of local and sub-national governments through additional finance mechanisms, institutional capacity building and enabling regulatory frameworks. While the draft text proposed at the beginning of the negotiations raised great expectations from the constituency, with many strong references to the role of cities and sub-national authorities in the climate change actions – even addressing the need for access to financial mechanisms – none of this remained in the final version adopted. However, we are confident that those proposals remain on the table and we will need to remain aware and active in the coming months, starting with the next talks to take place in Geneva in February, and towards COP21 in Paris in December 2015. Summit on Climate and Territories, convening local and regional authorities and civil society to display their actions on climate change, taking place in Lyon on 1-2 July 2015, organized by the Rhône-Alpes Region and UCLG. Bogotá Climate Change Summit, held at the invitation of the Mayor of Bogotá in September 2015. Summit of Local and Regional Authorities, at the invitation of the Mayor of Paris and Co-President of UCLG, Anne Hidalgo, organized back–to-back with the UCLG World Council, which will gather around 500 local and regional elected and representatives from across the world. Read the full Lima Communique here.